This is the full list of comments people made about problems with textiles classes and sewing, knitting an crochet as left-handers. I was taught to knit right handed, in turn taught myself to knit lefthanded. I don't have this at school, but I learned crochet for example by sitting in front of my friend and doing everything in reverse. I took no textiles classes in school. Although she has tried, my mother has not been able to teach me to knit, however my right-handed sister knits well. She is also better able to use the sewing machine than I.
Amazingly, my teacher asked when we started sewing if we were left handed or not, and showed the three of us, out of twenty, how to do it correctly. as the only left-handed person in the home economics class, had to learn to knit right-handed. At primary school was taught to knit left-handed. But I was luck and the teacher we had at school was left handed so could teach me too! but only sometimes, was taught righthanded way to knit only. Cant do it the opposite way. crocheting, and knitting yes, but sewing no. For sewing and crocheting, I do it opposite of right-handers, but I knit the same way as right-handers. Had embriodery classes and just did as everyone else did. Had to learn to do as righthanders. I always got in a muddle using the sewing maching as my pins were upside down and knitting - well don't even go there. I used to take my work home for my mum to do ! i asked the teacher to show me how to make my stitches go in the correct (according to her) direction but she could not. I can't knit or crochet to this day because I could never find a left-handed person to teach me. I could not learn this subject. They couldn't teach lefties or reverse. I crochet and I just pure had to start with left handed and I still continue using my left hand! I crochet in the opposite direction but have never been able to learn to knit. I crochet left handed, but learned to knit right handed because it was such a pain to transpose patterns. I cross stitch and do needlepoint. I use my left hand but make the stitches the way a right handed person would. I enjoy doing cross stitching in my spare time and stitch left handed. I hadn't used one before though so I wasn't used to it the other way round. It was a bit of an inconvenience. I have never come across anyone who has been able to show me how to crochet properly with the left hand, although many have tried and given up. I knit and crochet as a hobby, and have discovered that I do both right handed. I knit right-handed, but find it very awkward. I was taught to knit by my (right-handed) grandma, who tried to teach me using a mirror, but found it too difficult for both of us, so gave up an taught me the rightie way! i knit the wrong way, the teacher and my grandmother tried to teach me but couldnt adapt themselves to do it the left way. eventually learned by watching a book and reversing the pics in my head. I know how to sew, but have never really seen how a right hander sews. I cannot knit or crochet. I learned to knit from a book and never had any tuition. I never got very far with knitting! It it too hard to watch a right-hander and try and swap the whole thing in your brain. I often got fabric caught up under the machine becuase I manouvered it differently. I often pin my fabric back-to-front (or should that be the RIGHT WAY!) to everyone else and right-handers can't understand why. I sew and crochet in the opposite direction of my mom and she had to sit in front of me for me to finally understand how. I sew and crochet with my right hand. I still cannot knit correctly because no one can tell me the proper way to hold the needles. I taught myself crochet, and I simply reverse all the directions in my mind - I know I cannot ask for help from right-handers. I took a crochet class, but I was kicked out and told I was being difficult for using my left hand. I used to get very strange looks because we would be started off my the teacher and left to carry on sewing a piece of material for practice. When the teacher came round to see the results I'd turned over and started in teh opposite direction, it confused her slightly! I was crocheting backwards, but I managed to get a fix on the other stuff. I was taught by left-handed people who knew how to knit right-handed, and it's not that much different, especially because the left hand does most of the work, anyway. I was taught by righthanders so I do it the way they do it. 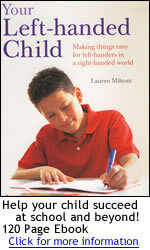 I was taught right handed - wish I hadn't been. I'm not sure if I crochet or sew lefty or righty. I go back and forth, switching hands while sewing. Don't know which hand is used for what in crocheting. It made me very self concious. I was much slower because the sewing machine felt more awkward and I even broke the needle! It was hard for me to learn crochet in school, because it was only explained for right handers. I've tried kniting and crocheting, but everytime I have someone show me they get frustrated and give up. I've tried to read books and look at the pictures , but its not the same as someone showing you. Knitting and crocheting are definitely difficult when trying to learn from a right handed person. Maybe THAT'S why I can't crochet! Mom had a degree in education and she was savvy about the whole lefty thing. She raised me to explain that I was a lefty and needed to reverse instructions / be trained in a mirror instead of side-by-side position. Early on I realized it was my job to speak up. I don't recall ever being given a hard time about it when I did. My junior teacher made me knit right handed and because I found it difficult and split the wool, dropped stitches etc, when everyone else was making nice white wool dolls vests, I had to use nasty green cotton string, which split even easier. She said it was a waste of nice wool to let me use it. My knitting after school program teacher actually taught herself how to do it left-handed so she could teach me. I told her to use the "mirror method" but she was bound and determined to do it the hard way! Good for her! My mom taught me to knit lefthanded. My mom tried to teach me how to knit, and couldn't because she's a rightie and I'm a leftie. I am extremely doubtful that a teacher would put in the time to teach a leftie the opposite knitting crocheting, etc. My mother taught me to knit lefthanded - not the school. And I taught myself to crochet left handed, not the school. My mum introduced me to a left handed lady she knew when I was eight - she taught me to knit. My teacher told me that I had to learn to use a right-handed sewing machine because our school doesn't have the money for a lefty one. Needlework teacher despaired of me so stuck me at the back of the class with knitting needles and a ball of wool, told to get on with it and not disturb her. never did learn to knit, because of this difficulty. Never took these, but the only way for me to learn to knit was through my mother teaching me the right-handed way. Only crochet I had to learn using my right hand. For knitting, there's for me no difference - I hold the needles in both hands. sewing machines are actually left handed!!! Sewing machines are very dangerous for lefties. Sewing machines were a little tricky to learn on because of the natural way I wanted to use it. I got used to it. Sometimes yes but usually we dont knit!!! That was hard to do! My teacher was trying to teach me how to knit, took about an hour becuase she could not figure out how to show me left handed. In the end she gave up, and I had to teach myself. That's why I've never been able to knit nor use a crochet. There was one teacher who knitted and sewed lefthanded, so I always had to transfer classes at that time. Was taught by parents to do it right-handed. When I was knitting at school my teacher couldn't follow what I had done and would ridicule me in front of the class. Which means the teacher can't help if you get stuck because your doing it the other way! Yes, but my Grandma taught me how to sew origionally, and she's left-handed. Yes, I cross stitch in the opposite direction to my mother-in-law who is RH, and I was never very good at knitting. My mum tried to teach me several times the RH way, and then my great aunt tried me with the LH way, and I just became utterly confused and so abandoned that hobby.